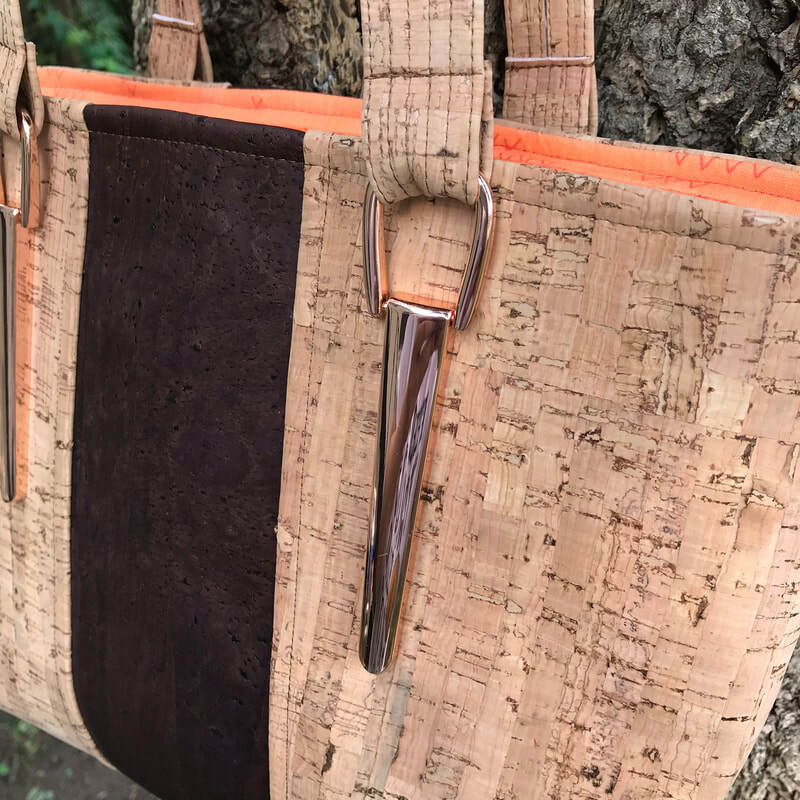 This natural cork fabric, or cork leather as it's often called, is perfect for making bags & wallets. It's backed with a thin layer of fabric similar to a faux leather. It's thin enough to easily sew on any domestic machine. It's pliable, bendable and easy to cut too! Just like with leathers and vinyls I recommend clipping instead of pinning. I also like to interface my cork leather for most projects (not wallets) using Decor Bond #809, my preferred choice in interfacing. You can cut it, iron it front & back (Except Unicorn Tears & Gold Fans - DO NOT iron front or you will damage it) and sew it like any other fabric. It's very durable, wears extremely well, and doesn't fray. I use my regular foot, thread and settings with no issues on my Janome 7700. ​All cork sold through Sew Many Creations is imported from Portugal. What can you do with each size? Mini Diva or Everly Backpack base. The 9" x 27" is great for the base of a purse or tote. 18" x 27" is the perfect size for the bottom of a Tourist Tote Bag or All Around Tote. 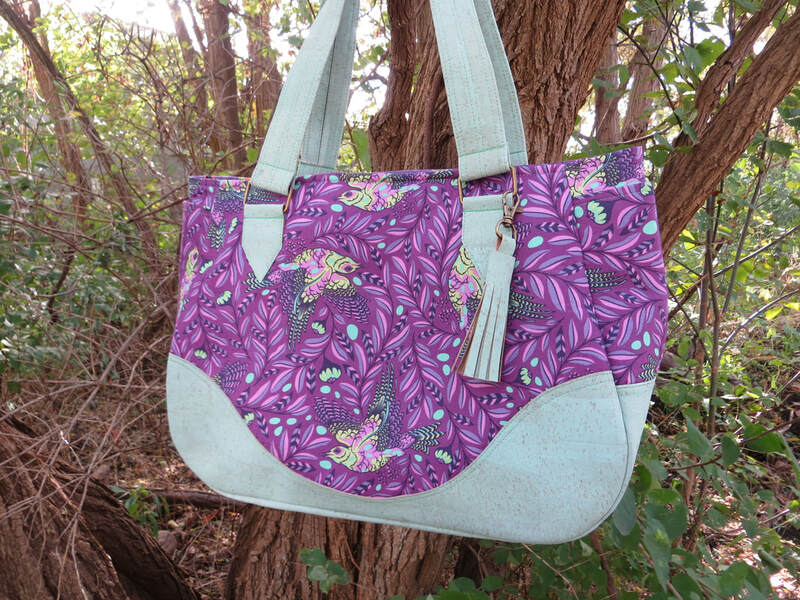 It's also perfect for the handles & accents of Harper Handbag or Abby Sling. 9" x 54" is great for making handles or the base of a larger bag. An 18" x 54" piece is enough for the base of a Road Trip Bag AND a Tourist Tote Bag. Pieces are cut individually and custom sizes are not available at this time. Colors vary from computer to computer so to help assist you in deciding, each cork color has a descriptive name. Swatches are not available. All sales are final. Colors go out of stock from time to tine. If you do not see a listing for a color on the page, it's currently out of stock - do not order. FREE shipping with the US. Orders under $50 will ship via first class mail. All orders of $50+ will ship via Priority mail. International orders are welcome! To provide you with the best possible shipping prices, a separate PayPal invoice will be sent after order is placed with least expensive shipping. Invoice must be paid before order can ship! Minimum shipping charge is $12. Natural Cork fabric in Sapphire Metallic Fleck - A deep Navy with metallic flecks of light blue. ​*DO NOT Iron the front side of this cork. It will hurt the metallic finish. ​Large Flowers are approx. 3" wide (not including leaf). This is a large scale print. 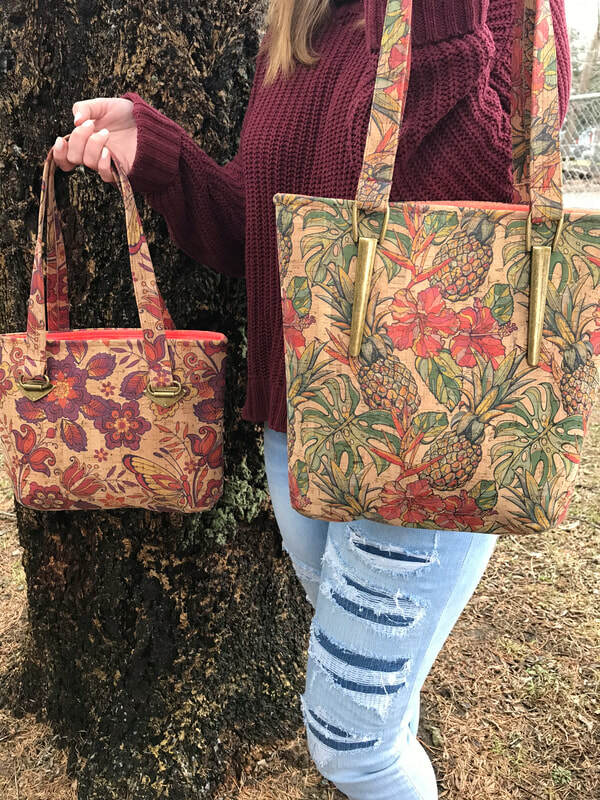 Natural Cork fabric with large print pineapple & hibiscus in yellow, red, green. 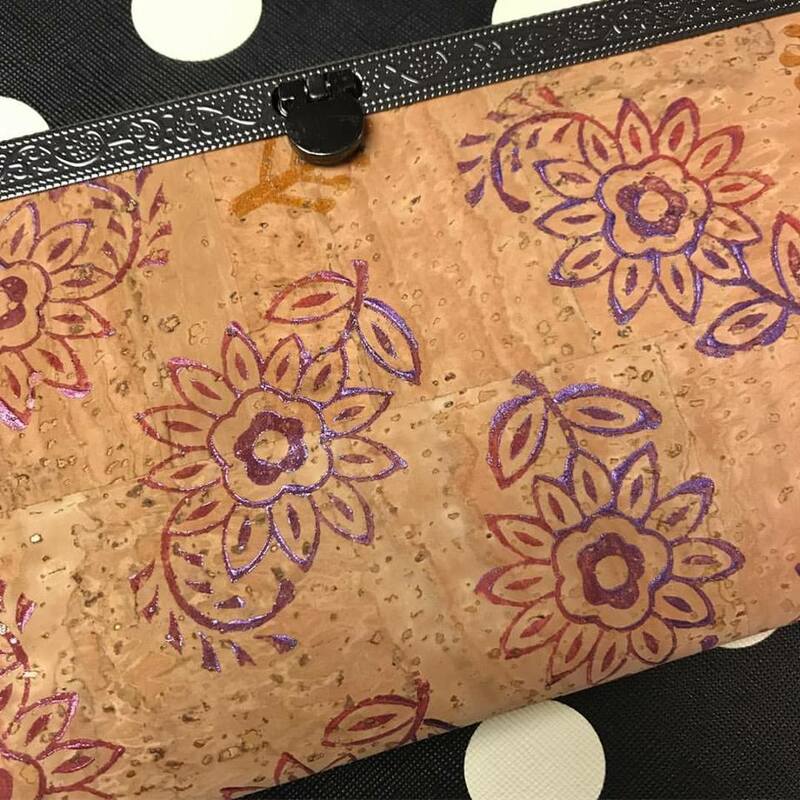 Natural Cork fabric with large floral/paisley print in blues, greens, coral, gold. Natural Cork fabric in Merlot Metallic Fleck - A rich deep merlot purple color with metallic flecks of pink & silver. Cailey Handbag with Textured Natural & Chocolate cork & Rose Gold Icicles. Free Download!! Make your own Cork Tassel using leftover cork! Please make selections carefully. All sales are final.